Completion dates are far off. Expected completion dates are 2012 and 2014 respectively and the final stations are yet to be confirmed. However, I think the plan will go ahead as it is a good idea. The following areas named below I would consider to be hotspots but do not expect a quick return. If you are thinking of investing in any of these areas focus on getting a strong yield rather than the hope of capital appreciation. The reason for this are that the plans are not definite. 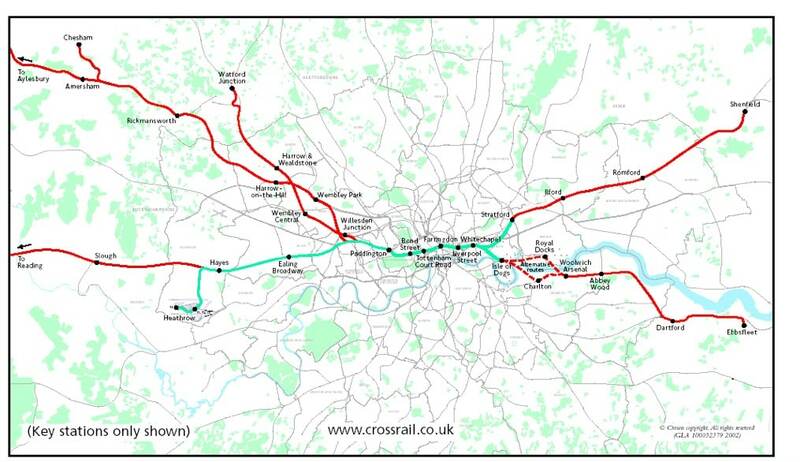 Crossrail line 1 will create a brand new network of services linking areas to the east and west of London. The heart of the project is the construction of a new tunnelled route across London, with new stations at Liverpool Street, Farringdon, Tottenham Court Road, Bond Street and Paddington. Crossrail Line 1 also includes an option to serve Heathrow Airport. The route will help to regenerate areas such as the Paddington, the Park Royal area, the Lower Lea Valley and the Thames Gateway. Crossrail Line 1 will, for the first time, allow existing suburban rail services to run through London offering a range of possible services to areas such as Romford and Shenfield to the east, and Ealing and Reading to the west. Interchanges will be provided with Thames Trains, First Great Western, Chiltern, London Underground, Docklands Light Railway, Thameslink, First Great Eastern, Anglia and possibly Connex services. 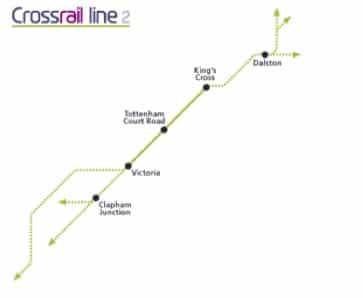 Crossrail line 2 would create a brand new network of services linking areas to the north east and south west of London. The heart of the project is the construction of a core section in tunnel through the centre of London, between Victoria and King's Cross with an interchange with Crossrail line 1 at Tottenham Court Road. new stations at Victoria, Piccadilly Circus, Tottenham Court Road and King's Cross St Pancras. The route will help regenerate areas such as Dalston, Hackney and parts of southwest London. Crossrail line 2 would allow existing northeast and southwest suburban rail services to be linked across London. The plans are yet to be finalized.